Welcome to the Lions of Doutta Galla website. Let me take you on a "tour" of what we are all about. 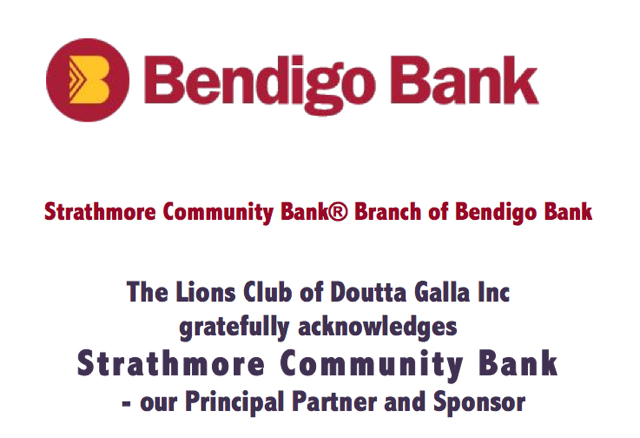 The HOME page provides you with some information about Doutta Galla, the Lions organisation and becoming a member. Here you will find links to news articles from our own members, the District and Lions nationally. The ABOUT US page gives you a chance to explore the history of the area that is Doutta Galla, and maybe a feel of how it is today. The EVENTS page provides a full and detailed calendar of when our events are happening, our meeting schedules and Lions District events. The PROJECTS page provides a summary of our project activities and access to more detail on specific activities being supported by the Lions Club of Doutta Galla. Select any one of the projects and read the story our members have provided. The GENERATION Y page provides a summary of our youth related project activities. Information is included with links to the full Lions associations, plus links into wider community sites for Youth Support. The SPONSORS page provides recognition to local and national organisations helping us to keep our activities in motion. These guys deserve huge thanks and our support. The LINKS page provides quick access to other information saved on the internet by our own Club, the District and Multiple District 201. There is a wealth of information here about the Lions organisation. The NEWS page gives you some special reading about what has been happening for the Lions Club of Doutta Galla. We hope you can see we are having FUN as well as providing support and assistance from the activities featured. District and National News is automatically maintained and included as links with our website. The MEMBERS ONLY page provides just that - members with update access can go in and submit their updates to this website. There will be offers posted here from our local supporters and from national organisations supporting the Lions. So that is the low down on the Lions Club of Doutta Galla website. Enjoy! !